Welcome to Pro Bike Wash. A professional bike cleaning company who support UK cycling events nationwide. We are a professional bike cleaning company who specialise in providing cycling event bike wash facilities. We support races for road cycling, mountain biking, cyclo-cross and more. We also provide static bike wash facilities for trail centres. 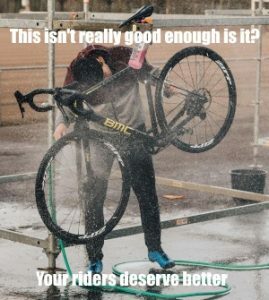 In our minds the last thing a rider wants to do when they finish an event is mess around with a pressure washer cleaning their bike. They want to get their finishing time, medal and get some refreshment before heading home. However nobody wants to put a dirty bike in the boot or on the roof rack either. The usual bike wash stations are just a glorified pressure washer on a stand, messy, slow and a huge waste of water. Waiting in line for the next rider to finish is not fun, especially when you are wet, cold and tired! But with our ProBikeWash a riders bike is washed and ready to take home in 30 seconds. They don't have to do a thing. It's simple. We provide a professional bike wash service to UK Cycling Event organisers as an added benefit for their customers. Our service sends all cyclists home with a clean bike after they have finished competing. Fast, no fuss and everyone goes home happy! Do you need cycling event bike wash facilities? See how we work with Cycle Event Organisers, Sponsorship Opportunities and then get in touch.